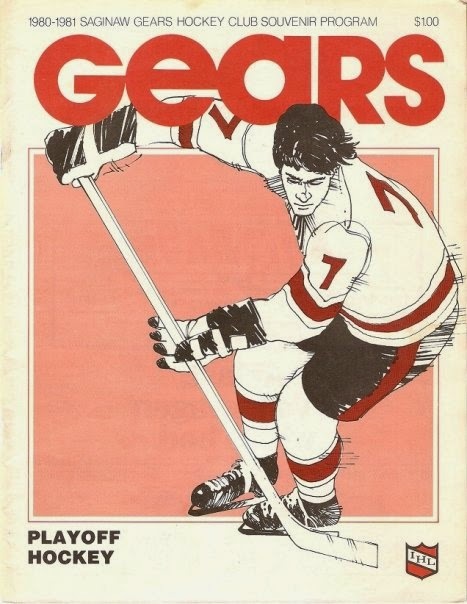 Covered the Saginaw Gears earlier in this blog, but I wanted to give the 1980-81 season it's own post, since I have two programs from that year. The Saginaw Gears were the first pro hockey team in Saginaw. They joined the International Hockey League as an expansion franchise in 1972, owned by former Bruins and North Stars executive Wren Blair. The Gears played their home games at the Saginaw Civic Center's Wendler Arena (now Dow Event Center), built shortly before the team's arrival. Their nickname was a nod to the Saginaw Steering Gear factory, now called Nexteer, on M46 on the east edge of town. 1980-81 was the ninth season of the franchise, which had established itself as one of the elite clubs in the IHL. They had already been to three Turner Cup Finals (1974, 1975, 1977), winning the Cup once (1977). Off the ice, the Gears were very popular in the Tri-Cities, often filling the 5500-seat Wendler Arena and finishing near the top of the league in attendance. 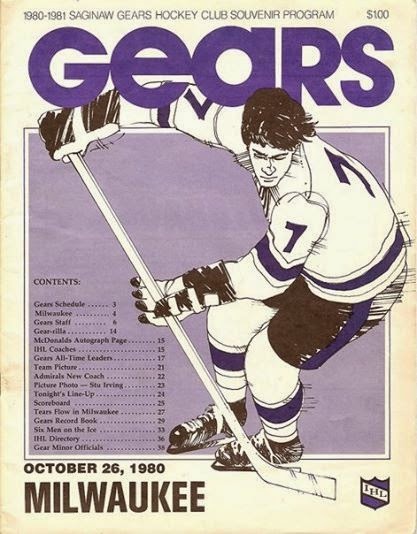 The Gears were affiliated with three NHL clubs that year: Boston, Hartford and Los Angeles. Head Coach/GM Don Perry (the only coach the team had to that point) was back behind the bench that year. His roster was led by original Gears center Marcel Comeau, a one-time Minnesota North Star prospect, who would win the 1980-81 scoring title and MVP award. Comeau was joined by minor-league snipers Scott Gruhl and Brent Jarrett, defenseman Peter Luksa, and future NHL netminder Bob Froese. Their opponent on October 26, 1980, was the Milwaukee Admirals, led by Head Coach Nelson LeClair. LeClaire's squad featured future NHLer Dwight Schofield, former Detroit Red Wing Michel Bergeron, and former Saginaw Gear Stu Irving, a member of the 1972 Team USA Olympic squad. The Gears, already a contender, received a serious dose of talent in January. The Central Hockey League's Houston Apollos, a fellow Los Angeles farm club, folded at midseason due to losses around $500,000 and low attendance. Owner Wren Blair was able to bring in several orphaned Apollo players, including Warren Holmes, Waddell, Claude LaRochelle and Doug Harvey. Saginaw, in first place with a 21-18-3 record at that point, went 24-11-5 the remainder of the way to finish 45-29-8. They easily captured first place in the East, their franchise-record 98 points were 20 ahead of second place Port Huron. Saginaw led the IHL in offense that year with 392 goals. Marcel Comeau topped the team, and the league, in points with 114 on the strength of 44 goals. Scott Gruhl (56) and Mike Hartman (51) gave the team two 50-goal scorers. Three other players scored at least 30 and one other scored at least 20. On defense, the Gears allowed 289 goals, second only to Kalamazoo. While using five goaltenders, Bob Froese and veteran Ted Tucker were the two main goalies. Froese drew the nod for the playoffs. Heading into the Turner Cup Playoffs on a hot streak, the loaded Gears demolished the rest of the pack. They drew the Port Huron Flags in Round One, who finished a distant second place with a mediocre 31-35-16 record. The Gears blew away the Flags in four straight, outscoring them 15-7 in the process. They then met up with the Fort Wayne Komets, who went 37-30-15. The program on the right is from Game 2 of that series. The Gears jumped out to a 8-0 lead by the third period, crushing the Komets 10-2 to take a 2-0 lead in the series. They would take the series in five games, outscoring Fort Wayne 27-13, to reach the Turner Cup Finals. In their fourth Turner Cup Finals appearance, the Gears faced the two-time defending champion Kalamazoo Wings. The K-Wings finished first overall in the IHL, with a 52-20-10 record. Kalamazoo earned a first-round bye, then annihilated the Flint Generals in the semifinals. 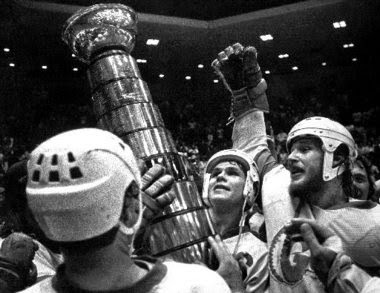 Their dreams of a third straight Turner Cup were dashed by the red-hot Gears. Saginaw shoved aside the K-Wings in four straight, allowing only 10 goals in the series. The Gears skated off with their second Turner Cup on home ice, a 4-1 triumph in front of a sold-out, delirious Wendler Arena. Both programs are nearly identical to each other: 47 pages, all black-and-white. The only big difference is the front cover color. A few articles in each program about several players, and directions to each IHL arena. The Gears-Milwaukee program has a picture of former Gear Stu Irving, who was recently acquired by the Admirals after the Grand Rapids Owls folded. Local ads include WEYI TV 25 (then a CBS affiliate), Peet Packing, and Schaefer & Bierlein of Frankenmuth. There's also a picture of the Gears' mascot, the crazy Gear-Rilla (the suit is now on display in the Saginaw Castle Museum). Aftermath: Despite the franchise's best season and dominating playoff run, the Gears filed for Chapter 11 bankruptcy protection in June. Attendance slumped to 140,200 for the year, down from 178,300 in 1978-79. By this time, the country was just emerging from a serious recession. The American auto industry was also in decline by then, due to increasing foreign competition. Increasing layoffs and assembly line mechanization led to soaring unemployment and an increase in people leaving the region for work. While a 3,419-per game average doesn't sound awful (and would have been welcomed enthusiastically by Saginaw Lumber Kings in the 1990s), tickets sold was one of the few sources of revenue for the club. The Gears had a lopsided lease with the City of Saginaw for Wendler Arena, in which the team received no money from concessions, parking, or food and drink sold at The Blue Line Club. This was also an era before advertisement space was sold on the boards (the UHL Wheels were the first Saginaw hockey team allowed to sell ad space on the boards). While this type of lease was fine when business was booming in the 1970s, a significant drop in crowds like this put the franchise in the red. Having only a few home playoff dates didn't help either. "Our playoffs were so great, so good that we took the Turner Cup in just 13 games," said co-owner Ken MacDonald. "This normally would have been achieved with at least three more home games and the corresponding revenue. While it is difficult to criticize the team for winning, it is a Catch-22 situation." The Gears reorganized under Chapter 11 bankruptcy protection and emerged with new ownership. The franchise and the City of Saginaw agreed on a reduced rent for the 1981-82 season, dropping fees to 15%. However, attendance never fully recovered, and the team folded due to increasing financial losses after the 1982-83 season. Saginaw would not have pro hockey again until the Flint Generals, with former Gear Dennis Desrosiers as Head Coach/GM, arrived in July 1985. In 2013, the Gears were passed by the OHL's Saginaw Spirit as the longest-lasting hockey franchise in city history.